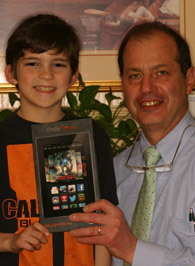 winner of our Kindle Fire Contest! Visiting the orthodontist is an exciting time! A healthy and beautiful smile is one of the greatest gifts you can give your child because it gives them the confidence to achieve great things and succeed. Straightening their teeth may change their self esteem, not to mention the fact that most of their friends are probably getting braces too. Here’s what you can expect during your child’s first visit to the orthodontist in Mullica Hill. Your orthodontic consultation is really a time to gather information and create a personalized plan for your child. This initial appointment is typically complimentary and lasts one to two hours. During this time we’ll take photos, x-rays, and sometimes even impressions to make models of your child’s teeth. Dr. Alex Colalillo will provide a thorough examination during which he’ll discuss his findings and recommendations for your child’s treatment if necessary. Gathering information is important because every patient is unique, and requires their own individual treatment plan. 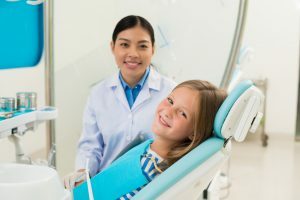 Our team takes the time to discuss and explain our findings with you so you and your child have a clear understanding of their treatment plan and the appliances that we may use to straighten your child’s teeth and correct their bite. We also want to make sure that your child understands what happens after orthodontic treatment, as they’ll need to wear a retainer at night to keep their smile aligned. During your first visit, our treatment coordinator will also give you an estimate of treatment cost, review your dental insurance benefits with you, and discuss your financial options. Many dental insurance plans offer an orthodontic benefit to help offset the cost your child’s treatment, and we’ll explain how that works and what you can expect to pay out of pocket. Orthodontic treatment may seem like a big expense at first, however we do work with flexible spending plans that you might have through your employer, and we also offer third party financing options. When you consider the long term benefits of orthodontic treatment such as the confidence, self- esteem, and improved bite and function it will give your child, it’s actually a small investment to make in their oral health. With two convenient locations, and decades of experience, if you’re looking for children’s braces in Mullica Hill, you should look no further than Dr. Colalillo. Contact our office today to schedule your child’s consultation.